Short ribs are often cooked in stocks and sauces with tons of vegetables. But adding cranberries, chocolate and rum makes this protein sweet instead of savory. Short ribs are one of my favorite things to make. It doesn’t matter if it’s in the slow cooker or a pot on the stove; when the dinner is done, I get a tender meat that fills my mouth with glee. Usually when I eat short ribs though, they’re coated in a deliciously savory gravy of chicken or beef stock and spices. I’d never ever considered cooking them with fruits before and chocolate… well that’s strictly reserved for dessert. But Sunset Magazine decided to add those sweet tart flavors to their short ribs and I’m so happy they did. The flavors were sweet without being dessert-like and the extra punch from the cranberries coupled with the rum made for a stew that was unlike anything I’d ever tasted. Maybe it’s time to try cocoa powder in more than just my brownie and hot chocolate recipes. Preheat oven to 450 degrees F. Cover a baking sheet with tin foil and set aside. Place about one tablespoon each of salt and pepper and 1/3 cup of flour in a resealable bag. Dry the short ribs on a paper towel. Place the ribs in the bag, seal and shake until ribs are coated with the salted flour mixture. Heat one tablespoon olive oil in a large oven-proof pot over medium-high heat. Add the ribs in batches, brown all over and set aside. Place the chopped yams on the baking sheet. Drizzle with one tablespoon olive oil and roast in the oven for 20 – 30 minutes or until caramelized. Remove from the oven, set aside and reduce oven temperature to 300 degrees F.
Cook the onions and garlic over medium-high heat in the oven-proof pot until tender, about five minutes. Stir in the remaining flour and cook until golden brown. Stir in the chocolate, stock, rum and zest and bring to a boil. Return the short ribs to the pot, cover and bake in the oven for two hours. Remove pot from the oven. 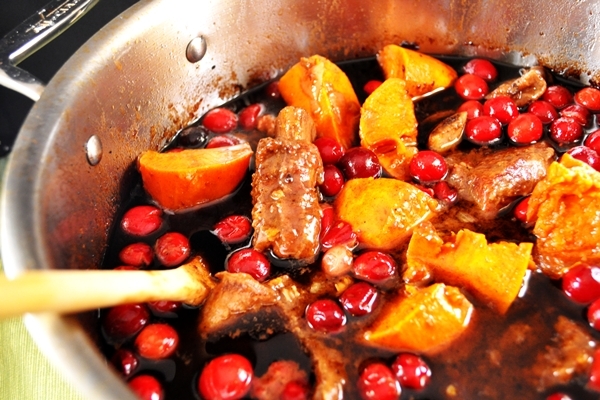 Add the cranberries and roasted yams, cover and bake for another 30 minutes or until the meat pulls away from the bone. Serve immediately.